The Canadian Research In Motion (RIM) telecommunication and wireless equipment company has introduced a new BlackBerry tablet in the United Kingdom. The successor to the original PlayBook portable device is called the PlayBook 3G+ and is now available to customers via retailers Micro UK and Insight UK priced at £424.79 and £415.19, respectively. 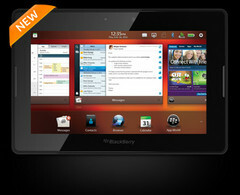 RIM’s latest tablet apparently comes in two different versions – Wi-Fi only and Cellular + Wi-Fi. The former packs a 1GHz Dual-Core CPU, whereas the latter is powered by a Texas Instruments OMAP 4460 system-on-chip (SoC) that houses two processing cores operating at a frequency of 1.5GHz. Moreover, both models sport a 7-inch capacitive multi-touch display with a native resolution of 1024-by-600 pixels (WSVGA). Users are also provided with 1GB of RAM and 32GB of storage (on the 3G version) or 16GB/32GB and 64GB SSDs on the Wi-Fi-only PlayBook. It might perhaps come a bit as a surprise that RIM’s new tablet in the UK is not in fact the 4G-enabled model available in Canada; however it is quite possible that the Waterloo-headquartered manufacturer could still be planning to add the more capable version to its UK portfolio later on. Connectivity-wise, this PlayBook features Wireless LAN 802.11 a/b/g/n, HSPA+ 3G and Bluetooth 2.1+EDR (yes, 2.1) modules, a GPS receiver, micro USB and micro HDMI ports. 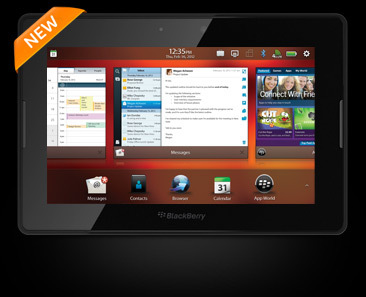 Based on a BlackBerry PlayBook operating system, the slate computer measures 10mm (0.4-in) thick and weighs 425g (0.9lbs) with the built-in 4800mAh battery. Other specs reportedly include HTML5/Flash 11.2 support and two integrated cameras – a 5MP shooter on the back (Full HD recording) and a 3MP front camera for video calls.